Product prices and availability are accurate as of 2019-04-22 03:43:22 UTC and are subject to change. Any price and availability information displayed on http://www.amazon.com/ at the time of purchase will apply to the purchase of this product. The Whynter ARC-13S portable air conditioner provides you with a convenient and efficient solution for your air comfort needs. This unit is extremely mobile and can be easily setup in almost any indoor location. It is most commonly used in computer rooms, bedrooms, classrooms and garages or workshops. It features the CFC-free R-410A refrigerant and advanced self-evaporating technology, which uses and recycles moisture collected during the cooling and heating process to produce cool air. 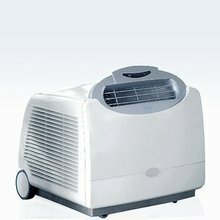 The ergonomic design with integrated handle, retractable pull cord, built-in caster and large back wheels make this the easiest portable room air conditioner to transport. This unit can cool up to a 420 sq. ft. of space (ambient temperature and humidity may influence optimum performance). Digital remote control. Two easy clean air filters Full thermostatic control (64 - 86 degrees), 24 hour programmable timer Upgraded plastic window kit (51" max.) included Dehumidifying capacity of 43 pints per day, 3 fan speeds Max. window kit length = 51" , Min. window kit length = 26.5"